Waxing is a standard grooming habit for countless women who routinely book a session without a second thought. Others, who have a low pain threshold, wouldn’t dare let a beautician with a hot bowl of wax near their skin. But if you’re toying with the idea, there’s a few simple steps that will make the whole experience less painful – and much more effective. FEMAIL called on Lainey Everett, Beauty Therapist at Charles Worthington, to sort the fact from the fiction and share her ultimate waxing do’s and don’ts – and even seasoned waxing fans should take note. Exfoliate your skin the day the before any waxing. Exfoliating should always be gentle and a prolonged session will make sure it is thorough. Exfoliating your skin allows any hair that may be tucked under dead skin to be lifted and easier to be removed. The less dead skin, the better the wax will come off your skin, therefore less pull and that equals less pain. Do maintain gentle exfoliating every second day post waxing to help keep those ingrown hairs at bay. Hydrate your skin daily. Keeping your skin hydrated keeps it supple and therefore more likely to deter ingrown hairs and general skin irritations. Regular appointments make a whole lot of difference. Our hair grows at three different cycles, so every four weeks is ideal. I have a personal policy to maintain best results all round for a happy client and a happy therapist – you either wax or you don’t! Check your skin health regularly Do this to make sure you don’t have any peculiar bumps or abrasions that will affect your skin during a wax. In particular, check your intimate areas and maintain a good standard of hygiene. Inform your technician of any medication you may be on that pertain to skin thinning or dryness. If you are on strong medication, such as acne medication or topical steroid creams, your skin is likely to be thinner and dryer than usual and this can cause skin lift which can result in an unsightly mark or burn as well as leave your skin open to infections. Wear loose clothing Opt for loose-fitting clothes where possible after your waxing session to avoid excess friction, particularly after intimate waxing. Prepare to roll over A good bikini wax should remove the hair from your buttocks and the inside of it. Shave in between waxing appointments. If you absolutely have to, make sure to do it no less than two weeks before your next waxing appointment to ensure best results. Hair has to be 4mm in length to be waxed. Longer if you are still a rookie waxer as your roots are likely to be thicker and quite content in their root bubble. Sunbed for 24hours before or after your hair removal session. Sunbedding makes your skin more sensitive and you run the risk of skin lift. Sunbedding straight after, you run the risk of burning the areas. Work out or use a jacuzzi/sauna/steam room for 24hours post treatment .Your follicles are wide open therefore more susceptible to bacterial infection. Working out causes a load of friction on the skin, which can also increase the chances of ingrown hairs. Spray tanning should not be done on the same day as your wax, whether pre or post. Pre waxing will result in a rather strange looking patchy area, and post waxing leaves you open to stinging, tan getting into your blood stream unnecessarily, as well as a ‘tattooed’ follicle effect! Ingrown hairs form when a hair cannot ‘escape’ through the follicle wall. Occasionally this results in a pustule like bump that feels painful and looks irritated. In other instances, the hair will just find its way out naturally and fall out as its cycle finishes or it will disappear into the layers of the skin. If you find you have a nasty red and sore bump that may look to be festering, then my best advice is too: gently exfoliate during a warm to hot bath or shower, if this doesn’t lift the hair, then grab a couple of cotton buds, apply pressure as to extract the follicle and have a serialized set of tweezers near by to pull out the hair. Try not to break the skin around the follicle, do not pick at it continuously and if you are worried because it is resembling a cyst like bump, do consult your doctor. Folliculitis is an actual ingrown hair condition. Not everyone has it and those who do, must be careful to use the correct aftercare. Replace razors frequently and do not use the same razor from an infected area to another. There are many natural remedies out there to help soothe this condition and decrease spreading, so do your research and ask your physician and/or dermatologist. Why is waxing more painful some times than others? When we are tired, run down and stressed, life in general can seem more ‘painful’. This is no different when having your hair removed. Three days prior to menstruation, we are known to be more sensitive. Many people will actually schedule their intimate waxing appointments around this time. Male waxing is an industry in its own right too. Some sporty men find that when they wax their backs, they end up with a itchy, patchy and bumpy areas, particularly over the scapulars. A good trick to help with this is to actually use a depilatory cream just over these areas and wax the rest. Waxing most of the back means you wont have to worry about hair growth for at least four weeks and the areas where you have used a depilatory area, the hairs will be finer as they grow through and you can top this up if you feel the need every couple of weeks. The benefit? It saves on painful friction whilst exercising. Painkillers, such as Ibuprofen and aspirin can help but I feel this is more of a placebo effect…which can’t do any harm if you are a frequent painkiller taker. The best way to make your waxing experience less painful is to be regular – you will find that having frequent sessions, every four weeks, will not only allow you to have a better over all effect but also it will be less painful. Why so specific you may ask? Because there are three different stages of hair growth and each stage grows at the same pace. If our hair only had one stage of growth, then all the hair would grow together, fall out together and then, after a month, re-grow…can you imagine how often we would be bald because, don’t forget, what happens on your body, happens on your face…think eyebrows! Hot wax VS Warm wax: I always ask a new client if she has had an experience with hot wax, the answer is always a yes! Soon after I explain the process of the waxing session, it becomes clear that my client has not actually had hot wax. There are two main types of wax, both are hot in temperature. Hot wax is a couple of degrees hotter than warm wax. Hot wax is very popular as the main type of wax down under in the southern hemisphere and equally so for our southern lady parts. Over the last five years, hot wax has become more of a staple in London beauty salons as the Brazilian and Hollywood wax became so big and mainstream. In short, hot wax is excellent in the more intimate areas. It is factually less painful because it does not stick to the skin; the patch leaves the skin with little tug and the result is that our pain receptors are feeling the hair coming out of the follicle and not the combined pull of the skin. Warm wax allows us to wax all over the rest of the body and we, as professionals, could not be efficient without it. 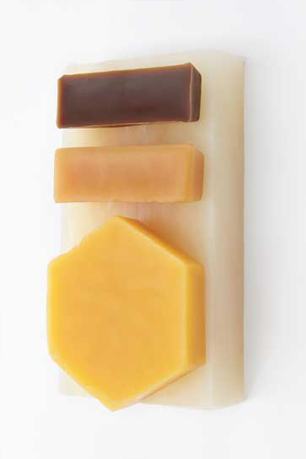 The best kind of warm wax is the creamier kind, again, as it is kinder to the skin. Post waxing treatments. I like to advise my clients to maintain an exfoliate-hydrate regime every two days. Keep the dead skin from piling up and keep the skin supple and smooth with a natural moisturiser. MYTH 1: Shaving your body and facial hair will make the hair grow back thicker and darker and faster. FACT 1: Imagine this: Take a stainless steel item, a sharp one at that, now glide the item over your forearm. Think about the fact that your hairs’ roots are approximately four fairly serious layers lower than the skins surface. Now, think about this: how does any object, sharp or blunt have the ability when glided over the surface of the skin, to affect the pigment, thickness and stimulate hair growth? It can’t, scientifically, it just can’t. The main reason for hair changing its depth of pigment and thickness in certain areas of the body is down to hormonal changes (puberty, age, menopause, PCOS) your DNA and, in some cases, medication. MYTH 2: Waxing from a young age will guarantee you will have less hair as an adult. FACT 2: There is no guarantee for permanent hair removal. This does help to reduce the hair over the years of very frequent waxing for a lot of skin and hair types however for some, this wont make any difference. MYTH 3: Shaving is a great way to exfoliate, especially on the face. FACT 3: Exfoliation and hair removal are two different things and should be kept separate for best results. Remember, use razors that are designed for the face and always use a very gentle facial exfoliator! MYTH 4: ‘I have curly hair, that’s why I get ingrown hairs’. FACT4: Ingrown hairs affect every kind of hair type as well as skin type. FACT 5: I can sort of understand this logic however, a good technician will hold your skin as taught as possible when removing the wax strip so very little amount of skin movement. However, if you did this every day, then I do believe that your skin would stretch to some degree from this continuous action.